Forgiving someone who hurts you is not always easy. Forgetting that they did something to hurt you is much harder. However, for your own mental wellness, it is beneficial to deal with the hurt and anger and try to move on. Staying angry or upset with someone does not cause them as much pain as you cause yourself by holding onto that hurt. When someone has hurt you, it's best to try and forgive that person and eventually forget what happened, though you never actually forget THAT they hurt you. Here are some ways to forgive someone whose hurt you and move on from the pain so that you can live a healthy pain free life again. Allow someone the chance to apologize when they've hurt you. Although you may be angry and not want to listen to someone who hurts you, it's important to get an apology and so that you can learn to forgive that person. The best way to get over being hurt is to hear someone say they are sorry for what they have done. Without that apology, your anger will turn into bitterness and you'll start to question more than just the event that happened. You don't need this harsh analysis of the situation, nor do you need more pain. Letting someone apologize to you for the harm they have caused will help you to start healing and recognize that a situation was not your fault alone, if any at all. Try to be open and listen to the apology that you deserve in order to get over the pain a situation has caused you and eventually forget the wrong done. Listen to an explanation of what happened. If you can open yourself up and hear someone out who has hurt you, it will help you to deal with the situation better. Having a reason can often give you a clearer picture of something that happened. You may not always believe the reason and see it as an excuse, but listening to an explanation can sometimes help you to make sense of things. An explanation can also help to ease some of the confusion and pain you feel when someone hurts you. Asking questions helps too. Tell the person that hurt you that you have questions and want them answered honestly. Listen to the answers you get and if they are not good enough for you, tell that person you want to know more. Getting to the bottom of why someone hurt you can help you to deal with the pain and forgive that person. You will even find that eventually your able to forget the wrong done and move on. Realize that everyone makes mistakes. We are all human and sometimes we are selfish people. Not everyone means to be this way, but it happens. Try to think of the situation as a mistake. Is what that person did something you can forgive easily? Or will it take more time. Sometimes, the more someone hurts you, the harder it is to forgive and forget. But it is important to remember that none of us are perfect and if we had made the same mistake...would we want forgiveness? Though it will be difficult for you to put yourself in someone's shoes who hurt you, it may help to see the other side of the story and think about what mistakes you may have made in the past. Have you ever hurt someone unintentionally? 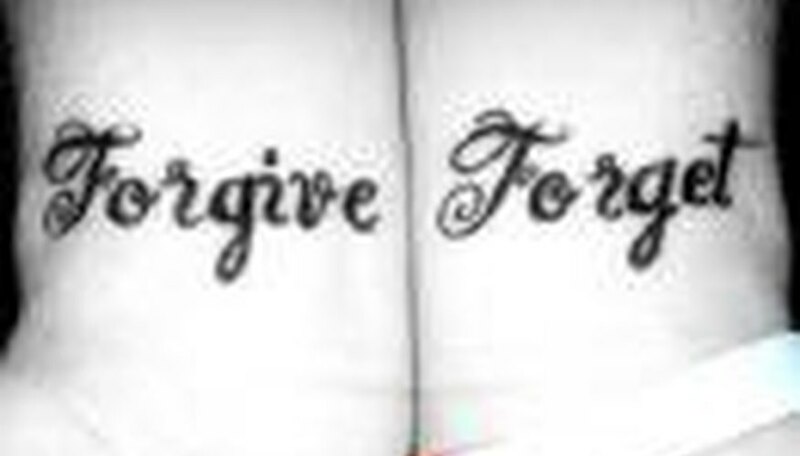 Was your mistake so terrible that it shouldn't have been forgiven? Putting yourself on the side of error can often help you to see a bad situation clearer and find a way to forgive someone who has hurt you. Give it time. Forgiveness is not always easy and the more hurt you are by a situation, the less apt you'll be to forgive and forget. Tell the person who hurt you that you need space. Explain that you are not ready to forget quite yet and need some more time to learn to forgive. Let them know how badly they've hurt you and that it's going to take some time apart for you to figure out how you feel. It's hard to think clearly when the person who hurt you is always around you. Time and space are necessary for us to heal and find out how we truly feel about a situation. Try to take this time to put things into perspective and figure out if you truly can forgive and forget. Remember that nothing is so horrible that we can't forgive (even if we can't forget) and let go of the pain that someone has done to us. Even if someone has hurt you so badly that you cannot ever speak to them again, it's still important to forgive...for your own mental health. Time heals all wounds as the saying goes and having time to yourself will put you into a clearer state of mind and allow you to forgive someone who hurt you, even if you are done with that person altogether. Contributor. "How to Forgive and Forget When Someone Hurts You." Dating Tips - Match.com, https://datingtips.match.com/forgive-forget-someone-hurts-5582444.html. Accessed 18 April 2019.